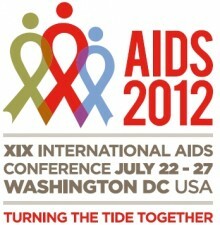 The International AIDS Conference is expected to draw more than 30,000 people from around the world to D.C. July 22-27. Former President Bill Clinton, former first lady Laura Bush, Bill Gates of the Bill and Melinda Gates Foundation, Health and Human Services Secretary Kathleen Sebelius, U.S. Global AIDS Coordinator Eric Goosby, “The View” co-host Whoopi Goldberg and singer Elton John are among those who are scheduled to speak at the Walter E. Washington Convention Center. The White House has yet to confirm whether President Obama will attend; California Rep. Barbara Lee and Michel Sidibé, executive director of UNAIDS, are among those who are scheduled to speak at the opening session on July 22. The Gay Men’s Chorus of Washington is also slated to perform. Posted July 15th, 2012 & filed under Health, News.